Some of the most amazing leaders I know! Trans Day of Remembrance (TDOR) is never an easy day. 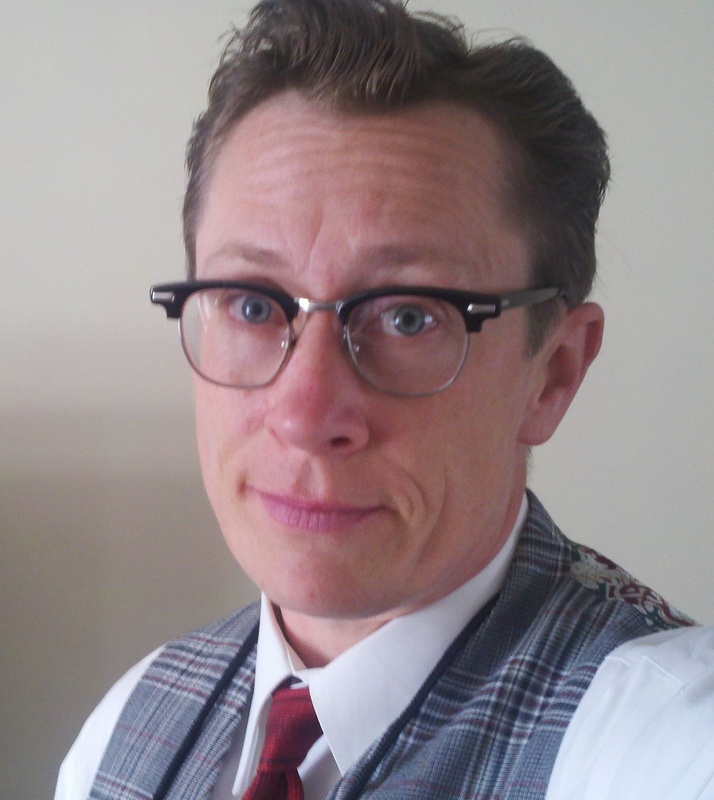 It’s sad, hollow, and hard – sometimes doubly so as you see some LGB brothers and sisters blithely go about as if it’s just another day. I woke with the name Malena Suarez on my mind. A few months ago one of my dear friends and a longtime Network ally, Sophia Isabel Marrero Cruz, called to say Ms. Suarez had been found stabbed to death. It’s one in a long line of trans murders Sophia has been working to counter in Puerto Rico and frankly, Sophia’s safety has been compromised because she’s stood up valiantly to call for more protection for these horribly vulnerable women. Trans Day of Remembrance is a day I take cold stock of my friends and loved ones – and hope fervently we all live to honor another year. It is also the only holiday my trans community has, a bittersweet one, but a truly healing one as well. 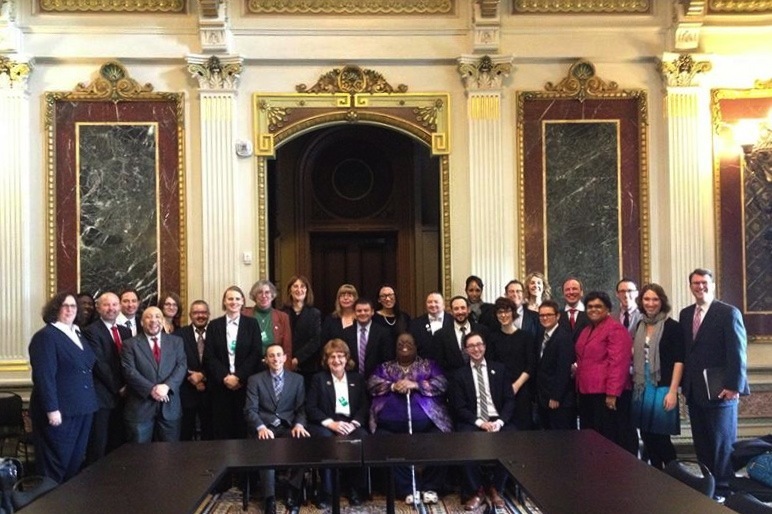 This year, I didn’t go to a ceremony for TDOR, I went to the White House to ask for change instead. Thank you to the LGBT liaison at the White House, Gautam Raghavan, for reaching out and inviting dozens of trans leaders in to outline our top priorities for the coming year. Thank you to the head of Office of Personnel Management, John Berry, for leading the meeting in a moment of silence to honor the too many who can’t be here to speak. But the best part about this observance was that then they asked us to tell them what we wanted to see change. I was frankly very proud of the two-dozen or so community leaders called to the table. You’d have never guessed we only spoke about what might be brought up Friday at 3 pm because we were a well-oiled machine, passing the ball adeptly around the room as one person after another hit the different notes that made up our joint priority list. What was our top ask? Fixing access to healthcare. We went into issues related to ACA implementation, then I took the ball to emphasize the importance of and steps to routinely including data collection on all surveys. 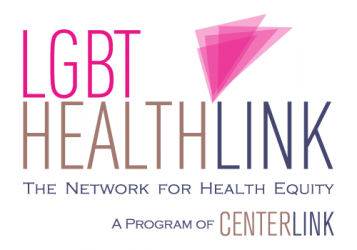 “Look, the federal government collects more data than any other entity in the U.S. but right now the only information you have on the incredible trans health challenges is from outside surveys – this can and should be fixed. We will forever be hamstrung in applying for research on our mental health problems, our high smoking rates, or anything as long as we’re invisible.” I emphasized how the research into measures had yielded several tested models for trans data collection, and we’ll follow up to give them details. Even though health is our priority, I watched proudly as the meeting rolled into a dozen or so other topics, labor, youth support, contractor non-discrimination, violence (I spoke up again here, talking about Puerto Rico and the dire need for more protections for advocates), and on and on. Clearly, the trans leaders present have been doing detailed constructive work on a huge number of fronts and we had very educated insight into the opportunities to move our issues forward. 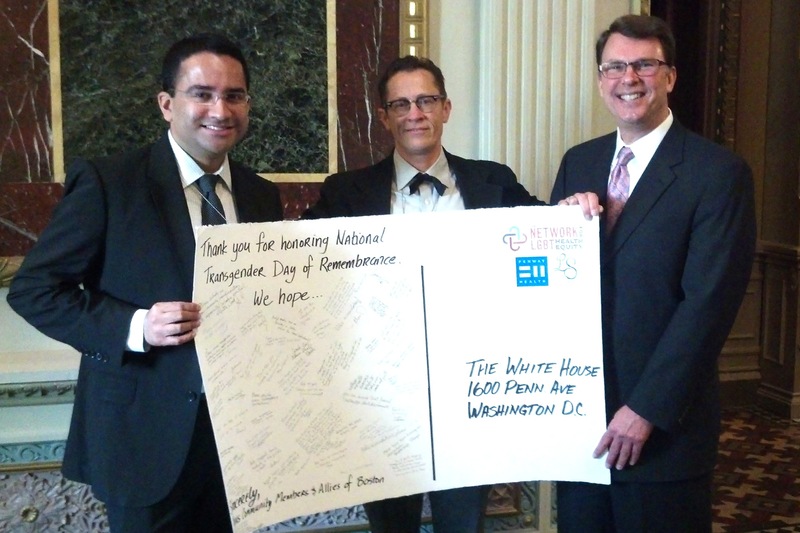 Gautam Raghavan, the White House LGBT Liaison, Scout, and John Berry, the Director of U.S. Office of Personnel Management, all hold the postcard where individual trans community members laid out their hopes for the future. As the meeting ended, I was able to go up and present our postcard to them, on which we allowed people from The Fenway Institute’s Trans Day of Remembrance Life Skills event to chime in with their important issues. I’m very pleased we were able to carry the voices of individual trans community members and allies to the White House – but if I’m left with one feeling about the meeting, it’s that the brilliant leaders there did an outstanding job of representing us.